Olson’s 30-year firefighting career was spent mostly in Arizona, where he rose up the ranks in different departments from firefighter/paramedic to deputy chief and chief. In 2001, Olson was deployed to New York to assist with the recovery from the Sept. 11 terror attacks. 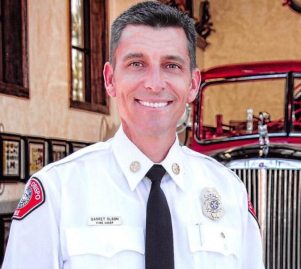 In 2011, Olson became chief of the Scottsdale Fire Department. The following year, he moved to SLO, serving initially as deputy chief. Then in 2013, Olson was promoted to SLO fire chief following the retirement of Charlie Hines. Olson will officially retire on Oct. 30. Deputy Fire Chief Keith Aggson will then assume the role of interim chief. Olson said in a statement that he wishes he discovered SLO earlier. Olson and his wife will continue to live in San Luis Obispo after the chief’s retirement. No problem, the city can always get the tax payers to agree to add 1/2 cent to the sales tax and say it’s for something else and use it to pay increasing pension funds for these exorbitant pensions.